Business planning is the magic bean for successful businesses. Use the business planning basics to put a plan in place, give it the continued attention it needs, and your business is going to grow stronger and better. Whether it grows bigger and stronger depends on the plan you've chosen, but the point is, without business planning, you have a fair chance of ending up with nothing but some churned up dirt to show for your efforts. 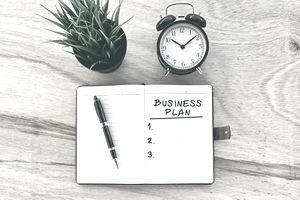 This article shows you how to use the business planning basics to create an action plan that will provide your small business direction for the coming year — or longer. When you've completed it, you will have a vision statement, a mission statement, and specific business goals that enable you to put your business planning into action. So let's start with the basics of business planning. The assumption of business planning is that you want your small business to be successful. So the first question is, "What do you want?" Make x amount of revenue? Become the market leader in its marketing segment? Bring in enough money that your family can live off it? Bring a process or product you've created to market? Make you personally a well-known name? These are just a few examples of what a successful small business may mean to you. Notice how money may or may not figure prominently in your interpretation of success. Now that you've decided what you want your small business to accomplish, we'll formalize your desires into a vision statement as part of the business planning framework. First, though, because a vision statement is all about choosing a future destination, you need to articulate where you are now, giving your business planning a starting as well as an endpoint. You'll do this by writing a mission statement, describing what your company does and how you do it. Now you have a mission statement that says where you are and a vision statement that tells where you want to get to, so you're ready to flesh out the business planning framework by creating the business goals that are going to get you there. The right business goals follow three goal setting rules. 1) Business goals need to be relevant. Business owners sometimes make the mistake of choosing business goals that are pointless. For instance, one person I know once set a business goal to hand out one hundred business cards a month. Well he did, but so what? If his intention was to bring in more business, we all know that the way to do that is to establish relationships with people, and you don’t accomplish that by just handing someone a card. The whole exercise was just a waste of time. To be relevant, a business goal has to be profitable in some fashion. That’s not to say that every business goal has to be measurable in dollars and cents, but it does have to possess a clear advantage or benefit to your business. 2) Business goals need to be actionable. An even more common mistake when setting business goals is to choose business goals that are too vague or abstract. Business goals such as “Andy’s Antiques will improve our customer service” sound nice – but if Andy’s Antiques is your business, how are you going to do that? When you’re setting business goals, be sure that you have developed them from general statements, such as in the example above, to specific actions that can be performed and evaluated. (See Setting Goals Is the First Step to Achievement to learn how.) Goals without action plans are just pretty words. 3) Business goals need to be achievable stretches. The purpose of business goals is to move our businesses forward and to motivate us. So we have to position the bar very carefully when we’re setting business goals. If the bar is set too high, we set ourselves up for failure and disappointment and many of us, recognizing this in advance, will just stop trying. On the other hand, if the bar is set too low, and all we have to do is step over it, we might not bother to do it as we won’t get enough satisfaction or recognition from the accomplishment. A goal has to stretch us to be worth doing. Recognize that a business goal has to “feel” worthwhile and set goals that will accomplish the dual purpose. Follow these three rules when you’re setting business goals and you’ll find that you’re automatically achieving more because you’ll no longer be wasting time setting goals that defeat the purpose of the exercise. It's time to put your mission statement, vision statement and business goals to use by creating an action plan for your small business. When you're done, pay special attention to the last section about revisiting your action plan and evaluating your progress. You know what will happen to your magic bean plant if it doesn't get any care!